Take a hike, emerald: there’s a new color player in town. Pantone, the arbiters of color, announced that Radiant Orchid, an “expressive, creative, and embracing purple,” is their 2014 Color of the Year. For the next year, this beguiling shade, with its undertones of fuchsia and pink, will be seen everywhere from runways to the aisles of Sephora, where it’ll receive its own special makeup kit. If your New Year’s resolution, like ours, is to try incorporating more color into your wardrobe, this cheerful shade is sure to liven up your winter doldrums. For casual wear: The easiest way to incorporate Radiant Orchid is by adding a pop of the shade to the standard weekend wardrobe of T-shirt and jeans. Pair this cute LOFT tee with a pair of crisp slacks, while this Splendid tank is a great layering piece that would liven up skinny jeans and a chunky cardigan. More boho types could pull off this slim Free People tunic tucked into a long, flowing skirt, perhaps with some cute booties to match. For the office: For more casual offices, this frilly Banana Republic top is soft and comfy, but still looks professional under a cardigan or blazer with dark jeans. Add in some dangly earrings, and you’re good to go. For more formal officewear, this Ella Moss top would look great under a black or dark gray suit, or try throwing a pop of color over a neutral outfit, like this cute Elie Tahari silk cardigan over a crisp white button-down and gray slacks. Want to dress up a bit more? This darling Milly dress and no-nonsense number from Theory have fashionable professional written all over them. For the timid: Not quite ready to take the leap into such a bold color? Even a piece with a hint of Radiant Orchid can offer a brighter, on-trend look. Tuck in a neutral flowy blouse with this skinny belt from Express, or gussy up in this Neiman Marcus + Target dress for date night — its neutral top half keeps things simple, while the purple pattern on the bottom adds a touch of color. 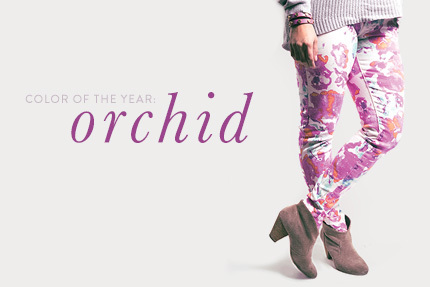 For the bold: Can’t get enough Radiant Orchid? These bright skinnies from Sanctuary will show your love for the shade loud and proud, and would look smashing with a relaxed white T and cute flats. Or get dressed to the nines in this strapless Gianni Bini dress — cover it up with a structured blazer, statement necklace, tights, and boots for a winter night out, then go bare-shouldered for a garden-party look once spring rolls around.